I'm 5 weeks out from Silver Rush, so Saturday's run was the first of three weekends in June where long trail runs are on the docket. First up was Bergen Peak/Elk Meadow Park in Evergreen. I had the pleasure of running with Patrick for the first time. We've emailed a bunch, but never gotten on the trail together. 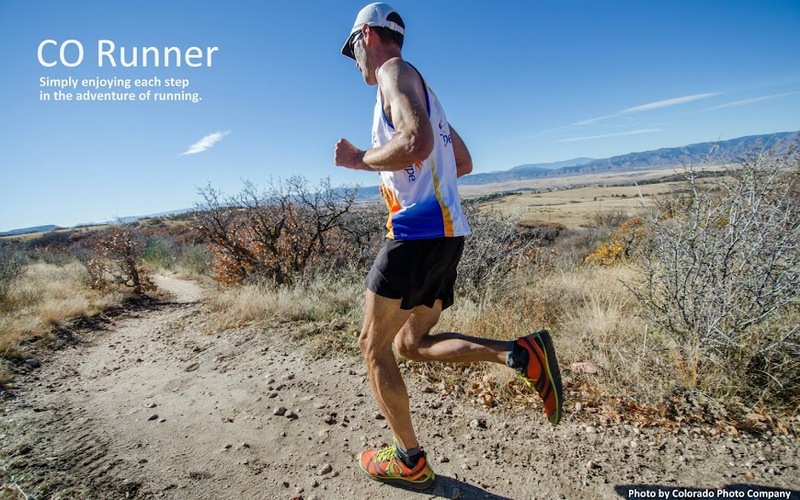 He's running in the Sun Mountain 50M this Sunday, so he agreed to join me for the first 10.5 mile loop as he's tapering for a strong race next weekend. Let me backup a bit. So we had a little rain on Friday night. From 11pm-2am, I was awoken about a dozen times from lightning flashes and rain/hail pounding the house. Tossing and turning, I finally rolled out of bed at 3:25, which was about 5 minutes before the alarm was set to go off. I left at 4:10 and it was cold, dark, and still raining. I held out hope that it was only raining on the plains and that the mountains would be dry. If not, I was trying to prepare for the mud that was waiting. Got to the trailhead a little before 5:00 and Patrick rolled in shortly thereafter. I was very impressed that he came since I couldn't help to think that there was no reason he had to subject himself to these conditions at the crack of dawn for a 10 mile run. When I got out of the car, I was surprised to see the rain had turned into a very light mist. Perfect! And the mud? Well, the trail up there was wet, but no mud. 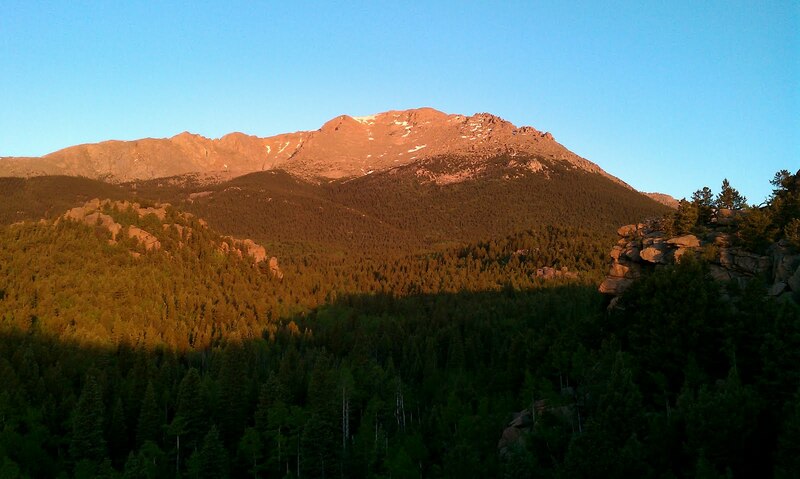 We started our loop and I noticed, in the pre-dawn light, patches of what I thought were snow. No, they were piles of hail. That area got hit pretty hard overnight. The higher we got, the colder the air turned and the more patches of hail we ran through. The trail rises about 2000' over 5 miles, so not the steepest out there, but also no walk in the park. Towards the top, you run through more aspen trees. The new leaves simply got pummeled by the hail and created a green carpet to run on. The summit (9708') was in a cloud. I'm going to have to head up there again someday in order to see the views. We made it back to the cars in just shy of two hours. Patrick took off and I grabbed my camera and went out for lap two. I cruised at just about the same pace, but encountered more rain and then mini ice pellets pinging me. It got old after awhile. Upon returning to the trailhead a second time, I grabbed my PB&J sandwich, refilled my water reservoir, and started out for lap three. Not the full loop, but a shortened 5 miler in order to get me over the 25 mile mark. Prior to the run, I had mentally committed myself to a run of 25-30 miles. Seeing I was at mile 21, I wasn't about to back out now. Starting out was tough. I was tired of being cold and wet, and couldn't get the thought of a hot cup of coffee out of my mind. It would have to wait. This run was critical, so I just pushed away my desire to bail on it and forged ahead. The small loop only had a few hundred feet of climbing and I ran through a herd of elk that bolted from the trail, so that lifted my spirits a bit. With a mile to go, the heavy rain returned and I cranked out my third fastest mile of the day. My watch said 26.16 miles. Would I go the extra .04 miles in the parking lot in order to register my first official marathon distance on a training run? Nope. Ha!! That cup of coffee was calling my name! I found it at McD's, as well as a mouth-watering Egg McMuffin. So it was interesting to learn that 26 miles on trails with close to 4500' of vertical is nothing compared to the pounding your body takes in the same distance on roads. I was sore, but I ran another 8 mi on Sunday and felt great. That would never have happened after a road marathon. Next up? Pikes and the Barr Trail. It looks like enough snow has melted that you can get pretty high, so we'll see just how far I get. My long awaited dash through the water, roads, and trails of Cherry Creek State Park is over. I have avoided the dreaded three event activity for years, but thanks to the encouragement from my soon to be Ironman friend James, I can now say I'm a triathlete! The Tri the Creek sprint triathlon yesterday was a perfect race for my first. I finished in 1:24:48 which got me 8th (out of 28) in my age group and 32nd overall. First off, to all those who have done a triathlon of any kind, my hat goes off to you! Going from one event to the next is very, very challenging. I'll lay out the play by play. I felt relatively prepared for the swim. I had gotten in the pool about 5 times since Boston. I was comfortable swimming 800 meters...in a pool. Stick me in 63 degree open water with a wetsuit and I was nervous to say the least. When my wave started at 7:34 am, we charged the water from the beach and started the 100 meter swim to the first of five buoys. I don't know what happened (probably a mixture of adrenaline & fear), but I couldn't put my face in the water without immediately needing a breath of air. So I had to swim freestyle with my face out...a glorified doggie paddle and not really an efficient or fast stroke. After the first buoy, I managed to settle down and got into a better rhythm with my normal freestyle. I can tell you that nineteen and a half minutes of swimming felt like 2 hours. Dizzy and already exhausted I jogged to the transition area while trying to peel my wetsuit off. James had let me borrow his 20+ year old road bike since I really didn't want to do this with my mountain bike. It was perfect and I'm grateful for his loaner. Although, I was a little intimidated by the guys and gals sporting their super slick, Lance Armstrong, Tour de France type bikes. Prior to the race, I had only ridden the bike two times. This was a big mistake. I kept up a good speed, but my legs were burning about 5-6 miles in. I locked in with two other riders and was able to hang with them for the second half of the ride. Getting off the bike was hilarious. Wobble, wobble, wobble went my legs. Alright, this was supposed to be my bread and butter right? Ha! Those legs needed a good half mile to work out the wobblies. I had no idea what pace I was running, but I knew I was breathing about as hard as I ever have during any run. But why did I feel so slow? That's where the compounding effect of the three events comes in. Even though I was sucking air in a hyper-ventilating manner, I learned at the end, I was hitting about a 6:50 pace. This is James at the finish. He baffles me with how he can do these signature jumps at the end of endurance events. I refused to try another jump after my Boston debacle in April! Well, he rocked a 1:18 in the tri and placed 3rd in his age group and 9th overall! Did I mentioned he road the last two miles of the bike on a tire that was steadily leaking air! I can't wait to see him tear it up in Boulder come August. 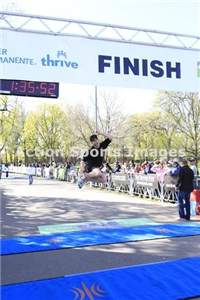 Check him out three weeks ago at the end of the CO Colfax 1/2 marathon...in which he PR'd! Love it! Well, the Tri is over and I'm zeroing my focus on training for Silver Rush...only 6 weeks away! Thanks James for encouraging me towards a Tri. Who knows if I'll get back out there for another, but I appreciate the experience I had with you!